Today we're going to make a musical instrument, the pan flute. Let's find out what a pan flute is. The pan flute or pan pipe is an ancient musical instrument based on a principle of the closed tube, consisting usually of five or more pipes of gradually increasing length (and at times, girth). 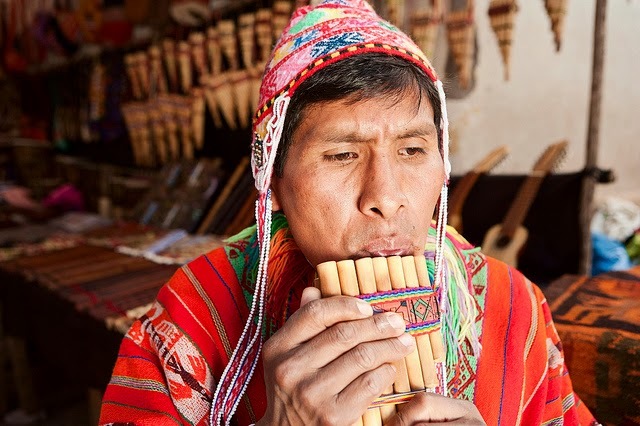 The pan flute has long been popular as a folk intrument in Peru and Bolivia, and is considered the first mouth organ, ancestor of both the pipe organ ant the harmonica. The pan flute is named for its association with the Greek god Pan. The pipes of the pan flute are typically made for bamboo or giant cane; other materials used include wood, plastic metal and ivory. - paint or something else to color it. When you have gathered all these things, let's get started. Cut the cardboard in two pieces each 1 inch by 3 inches, but really the exact sice doesn't really matter. Put glew on one piece of the cardboard and stick the straws to it. Now put gluw on the second piece of cardboard and place it on top of the straws like you see in the picture above. Have much fun making your own pan flute!